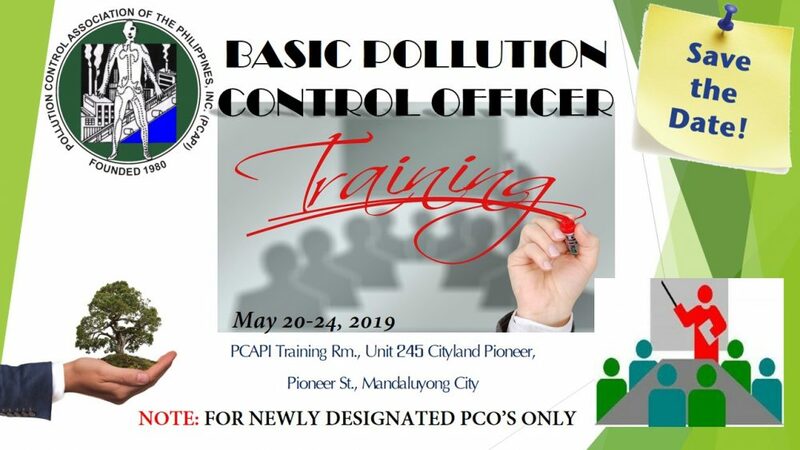 Dear Ma’am/Sir:The Pollution Control Association of the Philippines, Inc. (PCAPI) National, in collaboration with the DENR is undertaking a continuous training for Basic Course for Newly Designated PCO, a copy of which is also herewith attached for reference. This training program is recognized by DENR – EMB. The Basic PCO Training Course is scheduled tentatively on May 20-24, 2019 from 8:00 am to 5:00 pm (5 days) at the PCAPI Training Room, Cityland Pioneer, Pioneer St., Mandaluyong City. Participants will be limited up to forty five (45) only. Reservations, therefore, will be on a first-come-first-served basis. The training fee is P10, 000 per participant for non-PCAPI members and P9, 000 per participant for (PCAPI) members; inclusive of meals, cd presentations and Certificate of Attendance. Deadline for reservations is on May 15, 2019. Please settle your training fees on or before May 20, 2019. For reservation please visit our website www.pcapi.com.ph and register online. I like the way modules are presented and speakers from both DENR and private institutions are good. Hi. We will post here schedules once available po 🙂 rates will be the same. Thanks! Hi! As of now, we don’t have available schedule for June and July. We will post here as soon as available. Thank you! May I know why the training is only for newly designated PCOs? Thank you. Modules for Refresher Course has not been released yet. Do you have schedule in August? As of now we will have tentative schedule on the 2nd or 3rd week of August. Hi, would like to ask if you’ll be having a training for Type B or Non Hazardous and PCO Training for Managers soon? Thank you! Im interested to attend the next training for PCO, when n where po? Good Day. Do you have any upcoming schedule of training for the remaining months of 2018? Do you offer trainings/seminars in Davao City or Cagayan de Oro City? We will post schedules once available and we only conduct training/s here in Metro Manila. May i have the training schedule in visayas and mindanao i need to send 8 persons to be train . Hi just wanna ask if you have a seminar or training in pco. Just wanna know the date .thank you and where is it ? HI, i work from a government agency, we were planning to undertake training on PCO for accreditation…can you email us whenever there are available schedule? Will there be training held on September? do have schedule for this month September 2018 in Cebu? Hi there! is there any available training schedule for October or November? PCO training and Environmental Training for managing head. Is there any upcoming seminar/training for this month or on November & December? Any schedule for this coming December? We have January 14-18, 2019 schedule. Do we already have schedules for 2019? Yes we have. Kindly check our schedules now.